This is a fun and easy thing to do with the kids. My little guy loved it. We made some fab pics and spent the day in the sun. One of my goals this year is to make more time to spend with my little guy and my big guy, we did this together on a sunny day one weekend. 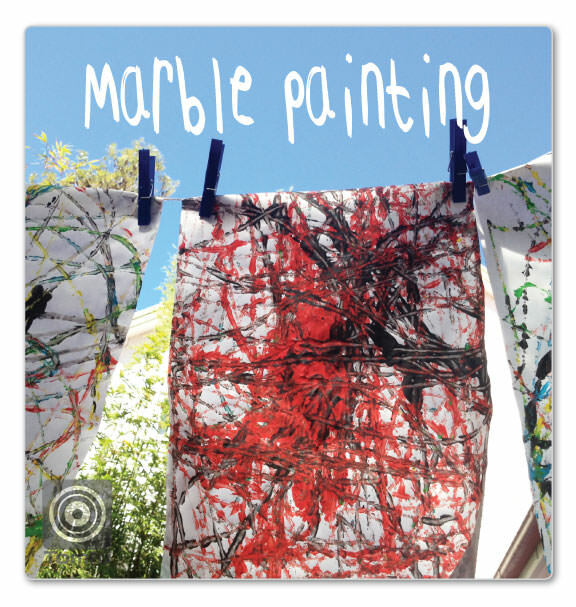 Get all your supplies together and put different coloured paints in cups with a marble in each. We used a spoon to get the paint onto the marbles. We placed some paper in the tray and then put our marbles in with the spoons and started rolling them around. Later on we also just dropped paint on the paper and rolled the marbles around, my little guy thought that was so cool. We hung them up on a makeshift line to dry with pegs. When we finished we pulled out some cushions and watched them dry in the sun while we checked out the clouds moving through the sky, we relaxed and read the paper too, what a magic day at home. I’ll show you what we made with these on my post next week. Here, your kids artwork in lights. « Who is Sarah Preston?